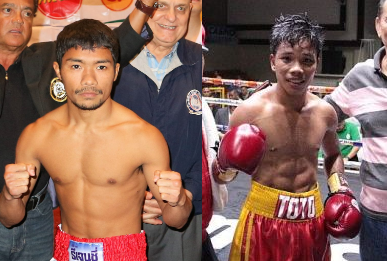 Filipino boxer Toto Landero is set to face the current WBA Minimumweight world champion Thammanoon Niyomtrong (Knockout CP Freshmart) on March 6, 2018. Landero is a 22 years old boxer from Pontevedra, Negros Occidental, Philippines, he has a record consisting of 10 wins including 2 victories by way of KO's and has only 1 defeats. Landero is currently ranked no. 12 contender in the WBA and won his last fight via unanimous decision against Powell Balaba on October 2017. He defeated the former world title challenger Vic Saludar also last year and only lost to Jason Canoy in 2016 via 6th round TKO. On the otherhand, undefeated Thai Thammanoon Niyomtrong is a 27 years old with a record of 16 wins with 7 by way of KO. The Thai won his regular WBA belt on 2016 against Byron Rojas and successfully defended it 3 times. Niyomtrong won his last fight against Filipino Rey Loreto last year via unanimous decision. Niyomtrong vs Landero will be held at Chonburi in Thailand.